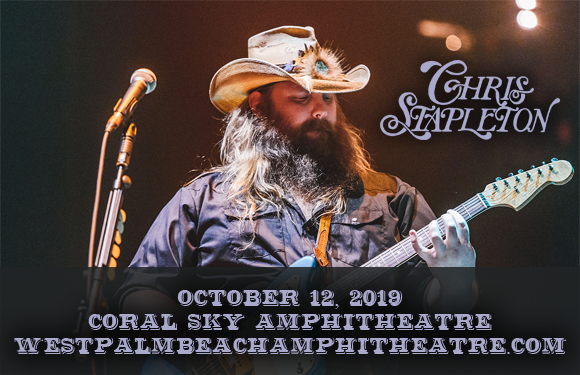 Performing tracks from his Grammy Award-winning albums Traveller and From A Room: Volume 1, and the Grammy-nominated From A Room: Volume 2, Chris Stapleton comes to Coral Sky Amphitheatre on Saturday 12th October 2019! The multi-platinum-selling Americana singer-songwriter will play as part of his extended All-American Roadshow Tour, which started back in 2017, and will be joined by special guest Kendall Marvel in support! Not only has American singer-songwriter, guitarist, and record producer Chris Stapleton made a successful career for himself as a solo artist, but he has also co-written six number-one country songs for other artists, including Kenny Chesney's five-week number-one "Never Wanted Nothing More", George Strait's "Love's Gonna Make It Alright", and Luke Bryan's "Drink a Beer". Stapleton's body of work has appeared on several prominent artist's albums, including Adele, Brad Paisley, Dierks Bentley, Vince Gill, Peter Frampton, and Sheryl Crow. After singing lead vocals for The SteelDrivers from 2008 – 2010, he left to concentrate on his own solo career, releasing his debut album Traveller with Mercury Nashville in 2015. Traveller was a huge hit, both critically and commercially, peaking at number one on the US Billboard 200 and gaining triple-platinum certification from the RIAA. He then went on to release From A Room: Volumes 1 & 2 in 2017. Stapleton has won multiple awards for his solo releases, including five Grammy Awards, seven Academy of Country Music (ACM) Awards, and ten Country Music Association (CMA) Awards.